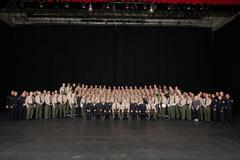 On Friday, January 4, 2019, a total of 82 polished recruits lined up at the Rosco C. Ingalls Auditorium at East Los Angeles College, in what would be their final platoon formation as academy classmates. After 22 weeks of rigorous academy training, the recruits pressed through an equally intense and meticulous formal class inspection by law enforcement executives just before the ceremony. The ceremony was a formal transformation of academy recruits into sworn peace officers. Academy Class 433 is made up of 11 female and 71 male graduates. 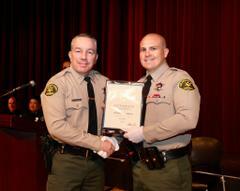 Sheriff Alex Villanueva presided over the graduation ceremony, and delivered encouraging remarks to their guests. Sheriff Alex Villanueva was joined on stage by Chief Sandra Spagnoli, Beverly Hills Police Department; Chief Carl Povilaitis, Glendale Police Department; Interm Chief Michael Ishii, Hawthorne Police Department; Chief Mark Fronterotta, Inglewood Police Department; and Chief Steven K. Zipperman, Los Angeles School Police Department, in presenting the graduates with their Peace Officer Standards and Training certificates. 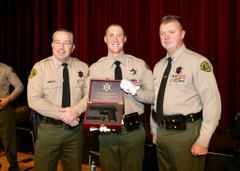 The graduates were then officially sworn in as California peace officers. In a special segment of the ceremony, Travis Tickel was named as the class Honor Recruit. This award is earned by the recruit who achieved the highest numerical average based upon leadership qualities, academics, marksmanship, and physical performance throughout the training period. Nicholas Connor was named the Academic Recruit. This award is earned by the recruit who achieved the highest academic scores. 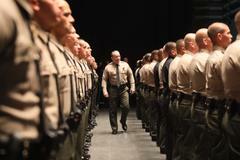 Each class of recruits processed through the Los Angeles County Sheriff’s Department Biscailuz Center Training Academy brings together a collection of unique aspects, qualities and experiences. Academy Class 433 claims a vastly international collection of backgrounds, reflective of the vast array of cultures found within Los Angeles County. Of the 82 graduating recruits, 8 were born outside the United States in the countries of El Salvador, Guatemala, Israel, Mexico, Philippines, and South Korea; 10 recruits lived abroad in the countries of Afghanistan, Iraq, Ireland, Israel, Japan, Korea, Mexico, and Philippines; and 44 recruits speak a language in addition to English, including German, Greek, Hebrew, Ilocano, Korean, Spanish, and Tagalog. We give a special thanks to the 23 graduates who carry on a proud family tradition of serving in law enforcement with our agency, the Long Beach Police Department, Los Angeles Police Department, California Department of Corrections and Rehabilitation, Los Angeles County District Attorney’s Office-Bureau of Investigation, and the United States Border Patrol. In addition to the social enrichment and mindfulness they bring to enhance our agency, 20 graduates also carry a substantial source of education with them, having earned a bachelor’s degree or higher. We proudly recognize the 20 graduates who served in the military branches of the United States Air Force, United States Army, United States Marine Corp, United States Navy, United States National Guard and the Israeli Defense Forces, as well as the 11 graduates with previous experience at other law enforcement agencies. For questions or information, contact the Sheriff’s Information Bureau at 213-229-1850.